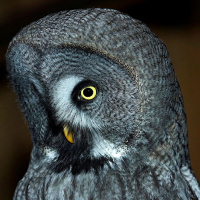 The Great Grey Owl is large grey owl with dense, fluffy plumage, long wings and tail, and a large head with no ear-tufts. The species name nebulosa is derived from the Latin Nebulosus, meaning misty or foggy. This Owl is the provincial bird emblem of Manitoba, Canada. Typical call - North Karelia, Finland. April 2010. CC Matthias Feuersenger. Description: The facial disc is circular, grey, and has many dark concentric rings. Short eyebrows and whitish lores form a white "X" in the centre of the face. Eyes are relatively small, bright yellow, and surrounded by blackish eyelids. The cere is greyish-yellow and the bill yellowish-horn. There is a blackish vertical patch below the bill that is flanked whitish, somewhat resembling a beard. Upperparts are dark grey with a brownish tint, densely vermiculated and mottled darker, with indistinct dusky streaks. Flight feathers are barred darker and paler grey to greyish-brown. The tail is relatively long, barred and mottled grey and dusky. Underparts are paler greyish with dark vermiculations, mottling and diffuse longitudinal dark streaks. The belly is barred dusky. Tarsi and toes are densely feathered grey, with dusky mottling. Claws are dark brown with blackish tips. Size: Length 61-84cm. Wing length 387-483mm. Wingspan up to 152cm. Tail length 285-347mm. Weight 790-1454g. Females are larger and heavier than males. 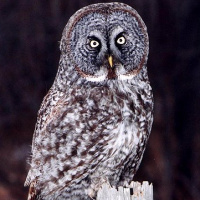 Habits: The Great Grey Owl is most active at nights, but also at dusk and just before dawn; sometimes active during the day in breeding season. They fly with soft, slow wingbeats and generally do not often move more than short distances between perches and seldom glides. They fly close to the ground, usually less than 6 metres up, except when flying to a nest. May be very aggressive near the nest. 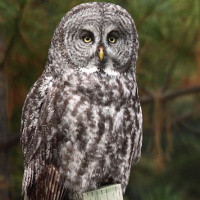 Voice: The Great Grey Owl has a distinctive primary call which is a very soft, low-pitched hoot "whooo-ooo-ooo-ooo" with the notes emitted slowly over a 6 to 8 second period. Calls are repeated every 15 to 30 seconds. This call is used as a territorial declaration and can be heard up to 800m away under good conditions. Territorial calling begins after dusk, peaks before midnight, then peaks again later. Males and females also give a single hoot when near the nest. Females give an excited "ooo-uh" when the male arrives with food. When excited near the nest adults growl, shriek, hoot, wail, and snap their bills. 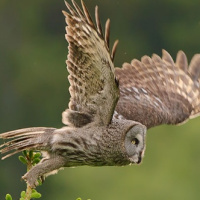 When threatened, a Great Grey Owl will snap its beak, spread its wings, and growl. 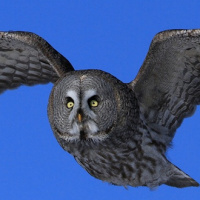 Hunting & Food: The Great Grey Owl hunts mainly during early morning and late afternoon, especially during winter, but will also hunt during other daylight hours and at night. They are often seen perched on poles or fenceposts along roads. 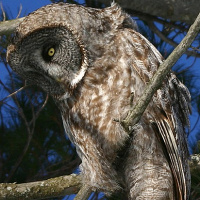 When hunting, a Great Grey Owl will use a perch to "sit and wait" or it may hunt through the forest a metre or so above the ground. 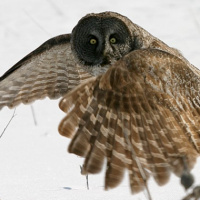 When ground is covered with snow, a Great Grey Owl can hunt by hearing alone and often plunges into the snow to capture small rodents moving underneath as far as 30 cm. 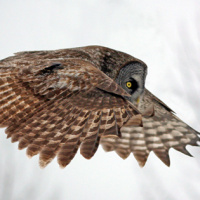 Although a very large Owl, small rodents are their primary prey (80 to 90% of diet) with voles being the most important food in Alaska, Canada, and Oregon. Pocket gophers are the most important food in California. Other mammals taken include rats, mice, shrews, squirrels, rabbits, chipmunks, moles, and weasels. Birds are rarely captured, and include crows, small hawks, American Robin, ducks and grouse. Frogs, toads, snakes, and insects are taken very infrequently. Pellets are dark greyish-black, compact and very large - 7.5-10cm x 2.5-5cm. Breeding: Courtship involves feeding and mutual preening between mates and begins in midwinter. The male typically approaches the female, holding food in its beak, which is passed with both birds closing their eyes. The male selects possible nest sites and attracts its mate with calls. Several sites are inspected before she chooses the nest site. 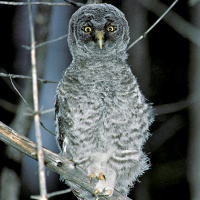 The Great Grey Owl nests primarily in stick nests made by hawks, ravens, or crows, in the hollowed out top of large-diameter snags, or on the top of clumps of mistletoe, and in Europe sometimes on the forest floor. Northern Goshawks are very common providers of nest sites for Great Grey Owls. They also readily take to artificial platforms or nests placed in suitable habitat. Nests are usually in a forest, but with a large clearing or meadow located within 1.3km. Unlike most other Owls, nests are usually tidied up and refurbished before use. Nest linings include conifer needles, deer hair, moss, and shredded bark. 2 to 5 (average 3) eggs are laid, each separated by 1 to 2 days. Incubation commences with the first egg laid and lasts 28 to 29 days. The female does all incubation and the male provides all food to the female and young. The female tears food into small pieces and feeds the young. Young leave the nest at 3 to 4 weeks and can climb well. Fledging occurs after about 8 weeks and young remain near the nest for several months, with the female caring for them. 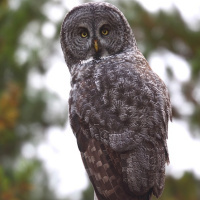 Great Grey Owls are single-brooded but will readily lay replacement clutches if the first clutch or brood is lost. Males and females aggressively defend nests and have been known to drive off predators as large as black bears. Among other threats, ravens and Great Horned Owls prey on eggs and nestlings. 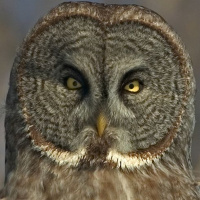 Great Grey Owls are semi-nomadic, with irregular site or mate fidelity between years. They tend to settle and nest in areas with high food resources and this may lead them to occupy the same nest for several years or move off to new areas. 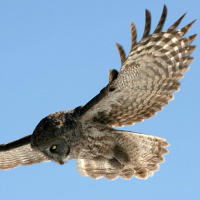 Nesting territories are defended from other Great Grey Owls, but foraging areas are widely overlapping. This leads to higher than expected densities, for a large bird of prey. In areas of good habitat this may be as high as 1 pair/58 hectares. Mortality: They are long-lived birds, with captive owls living to 40 years of age. Mortality in the wild is often due to starvation. Natural enemies that prey on juveniles are Great Horned Owls, marten, and wolverines. Fatalities caused by humans include shootings, road kills, and electrocutions. 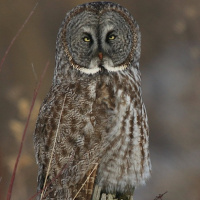 Habitat: Great Grey Owls inhabit a range of forested habitats. 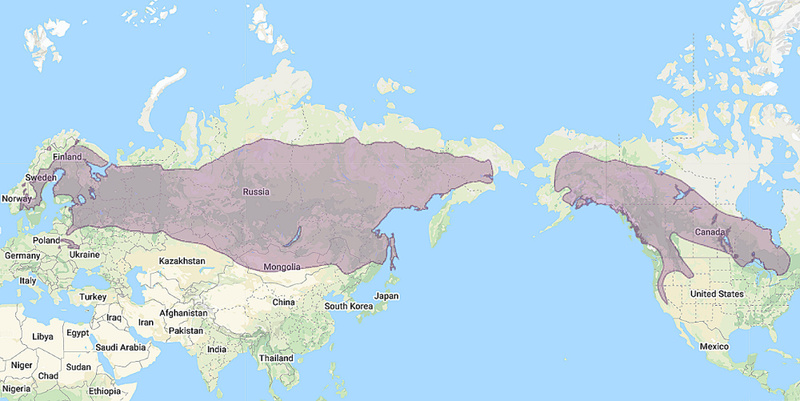 In far north America, they frequent stunted coniferous forests along the edge of the Arctic treeline, through spruce and tamarack muskeg forests further south. In the Sierra Nevada Mountains they breed in mixed conifer and red fir forests. Nesting habitat usually includes copses or islands of aspens within pure stands of conifers. Most foraging is done in open areas such as swamps, bogs, and forest clearings where there are scattered trees and shrubs that can be used as perches. During migration they may be found in estuaries, mountain meadows, and along farm fields. 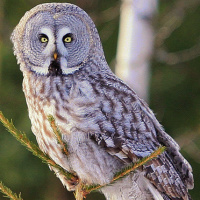 Distribution: Great Grey Owls are found from Alaska across Canada, down the Northern Rocky Mountains, and northern Minnesota. They are also found in northern Europe and Asia. Populations may move well south of their normal range in years when prey, especially voles, are particularly abundant there. Status: Not threatened or endangered. Original Description: Forster, Johann Reinhold. 1772. Philos. Trans. R. Soc. London, 62, p. 424. Duncan, James R.. 2013. "The Complete Book of North American Owls". Thunder Bay Press. 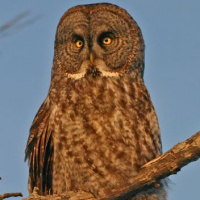 See also: Other owls from North America, Europe, Asia, Genus: Strix. Page by Deane Lewis. Last updated 2015-11-09.